Black Bean Salsa Chili adapted from Cooking Light. This is so good, and if you love chili but don’t want all the calories try this one, it is ground turkey and black beans that turns the original pinto bean and ground beef chili into a healthy dish. If you are looking for the original chili check out this Beer Chili I tried before…made with beer! 1. Combine 1 1/2 cups beans, 2/3 cup water, and sugar in a food processor; process until smooth. Combine bean puree and remaining beans in a bowl. 2. Heat a large saucepan over medium-high heat. Coat pan with cooking spray. Add turkey; cook 3 minutes or until browned, stirring to crumble. Remove turkey from pan. 3. Add onion, bell peppers, and bacon to pan; cook 5 minutes or until bacon and onion are lightly browned. Return turkey to pan. Add chili powder, cumin, oregano, and crushed red pepper to pan; stir well to coat. Stir in bean mixture, salsa, tomato paste, and broth; bring to a boil. Reduce heat, and simmer for 30 minutes, stirring occasionally. 4. Combine sour cream, cilantro, and juice in a small bowl. 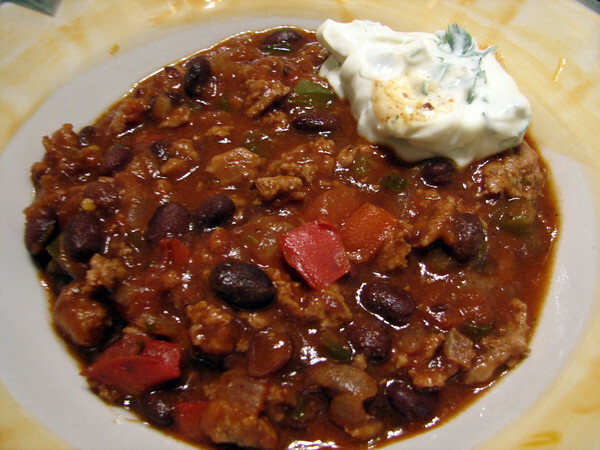 Serve chili with sour cream mixture.